The Resistance! : Stimulus Bill would ban money to buildings used for religious instruction. Stimulus Bill would ban money to buildings used for religious instruction. 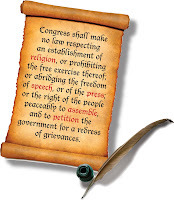 Congress shall make no law respecting an establishment of religion, or prohibiting the free exercise thereof…unless your institution of higher learning is getting part of the massive (nearly $900-billion and counting) Obama/Reid/Pelosi stimulus proposal. Such language is unconstitutional and could leave some institutions of higher learning susceptible to a legal action by organizations like the American Civil Liberties Union (ACLU) according to a spokesman from South Carolina Republican Sen. Jim DeMint’s office.